Just about the time we run out of garlic from last year’s crop it’s time to start eating green garlic. Often called spring garlic or green garlic, it is simply garlic that is picked early in the spring before the cloves begin to form. 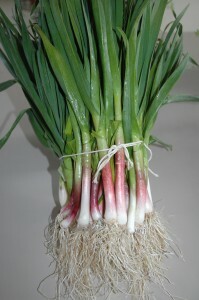 This entry was posted in green garlic, In the Garlic and tagged garlic for cooking, green garlic, spring garlic. Bookmark the permalink.